Over at my other blog, I’ve been writing about a bevy of announcements that Apple Computer made at this week’s Macworld Expo here in San Francisco. One of them was of a new software product called iWork. Hake’s Americana and Collectibles has been conducting auctions of high-grade cartoon memoribilia for years–but I’ve never seen an auction of theirs with as many things I’d love to own as their current one. The array of vintage character dolls is particularly stunning. Rather than describe them, I think I’ll just show a few. I don’t know if I’ll bid on any–probably not, since Hake’s understandably expects most of them to go for a lot of money–but I’m sure having fun perusing the site. Mike Barrier Loves Polar Express! Posted by HarryPosted on January 9, 2005 1 Comment on Mike Barrier Loves Polar Express! One of the joys of the Web is the ability to see news from all over with a few clicks. And I’m pleased to find that many, many sites around the world took notice of Will Eisner’s passing and paused to tell their readers just how important he was. When Charles Schulz passed away, I compiled a page of links myself–but this time, I’m taking the easy way out and simply pointing you to Google News’s automated collection of stories about Eisner. There are 203 of them at the moment, and while some are wire copy, many others are original, and most are from mainstream media sites, not ones for comics geeks. Will Eisner, who managed to be one of the most interesting artists working in comic books for two-thirds of a century, has died at the age of 87. I’m a little stunned–you don’t think of somewhat that vibrant dying so unexpectedly, regardless of his age–or at least I don’t. (At last year’s San Diego Con, he was one of the most animated, intellectually-engaged guests I saw on any panel.) And I’m on a business trip. So for the time being I’ll just point you to Mark Evanier’s report and Mike Barrier’s essay on Eisner’s work. We live in a strange world. 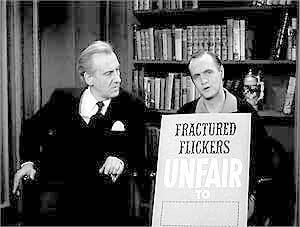 For several decades, Jay Ward’s Fractured Flickers was obscure and mostly unavailable, unless you were enterprising enough to track down 16mm prints or video bootlegs. 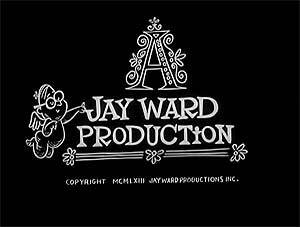 Jay Ward fans would have been grateful for the opportunity to see just an episode or two. I bought my set last week, and have spent a chunk of the weekend getting reacquainted with the show. (I have bad bootlegs of a few episodes, and remember when the Showtime cable channel showed it about 25 years ago.) Having watched most of the episodes, I’m startled by my reaction to them–both what I liked and what I didn’t. 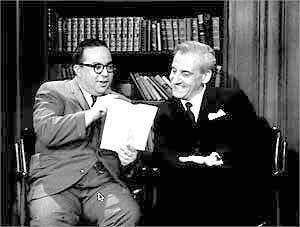 I assume that most of the people reading this are familiar with the show’s gimmick: The Ward studio took silent films (from forgotten dramas to classic comedies), sliced them up, added funny soundtracks, and turned them into sketches in a show hosted by Hans Conried. This was, I guess, a novel idea in 1961. 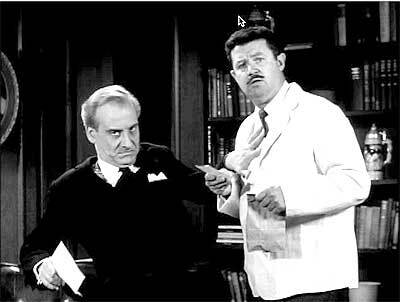 And it can still be funny, especially when the comedy gets dada–one bit takes footage of Hitler, adds dubbing in Bill Scott’s Dudley Do-Right voice, and turns the Fuehrer into a teenage etiquette advisor. And a bit about “Dalt Wisley” and his “magical dictatorship” of a theme park remains one of the nastiest, funniest Disney parodies ever. I laughed repeatedly while watching this stuff, and was struck by the fact that the show has not a 1920s feel so much as an LA-in-the-early-1960s flavor. (There are a lot of throw-away gags about places like Tarzana and Sherman Oaks.) But a little “fracturing” goes a long way (of course, it was meant to be watched in half-hour increments once a week–rather than the whole series in one long jag). Like early Rocky and His Friends but unlike most other Ward shows, Flickers has a laughtrack (and cheesy sound effects), which doesn’t do a thing to make the proceedings feel more risible. The shows seemed to get gradually less clever over the program’s run, eventually devolving into what seems like endless clips of A) cars crashing into things and B) buildings collapsing. 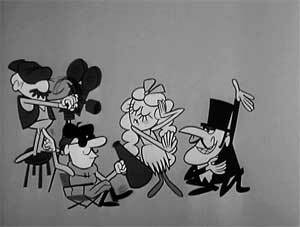 The one thing about the gagged-up silent films that remains reliably delightful is the voice work, by Conried, Bill Scott, June Foray, and Paul Frees–four of the greatest performers in the history of voice acting, and all at the top of their game. So much for the Fractured Flickers themselves. I was surprised I didn’t like them more. 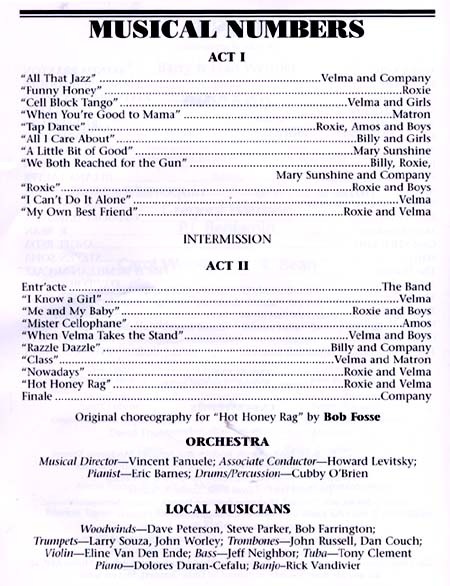 But I was equally surprised by how much I liked the bits (one per show) in which Conried did comedy with a “celebrity.” The list of guests is an amazing cross-section of Hollywood has-beens, up-and-comers, and eternal second-stringers, circa 1961: Rose Marie, Allan Sherman, Gypsy Rose Lee (! ), Bob Newhart, Annette, Fabian, Paula Prentiss, Sebastian Cabot, Paul Lynde, Barbara Eden, Ruta Lee (! 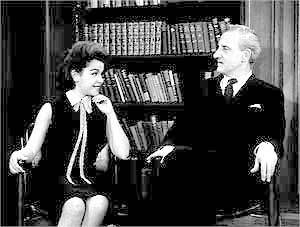 ), Edward Everett Horton, Cesar Romero, Zsa Zsa Gabor, the Bullwinkle Puppet, and others. Keith Scott’s The Moose That Roared says that the guests were determined in part by who was available when the shows were shot, but they lucked into an entertaining group of folks. Some of the guests seem baffled by Hans; Hans seems baffled by some of them. In certain cases they both seem to be struggling with the material. The general cheapness of the production (Keith’s book says they were hobbled by having only one camera, and everything was shot on the world’s crummiest set) adds a strange, strangely compelling edge. I’m only slightly embarassed to admit that I like this stuff–and also like the bridging sequences with Conried, who’s one of the few people in Hollywood history who seems to have been incapable of being unfunny. Of course, the statement calls her “Rose Maria”–which seems, somehow, like a Ward touch.